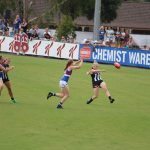 THE Magpies took the Victorian Football League (VFL) Women’s competition by storm, winning 13 straight excluding the draw in Round 2. Unfortunately, they fell short when it counted, which was in the finals. The Magpies would be happy with their season but so too disappointed they could not take home the silverware. Molloy proved to be one of Collingwood’s greatest assets throughout the VFLW season. In the AFLW, the youngster claimed the Rising Star Award, made the All-Australian team and won Collingwood’s best and fairest credit to her class, skill and high footy IQ. Molloy carried on in the VFLW, and was an absolute machine on the footy field, going in hard at the contest. She offered great run and carry and more importantly a safe set of hands across the ground. 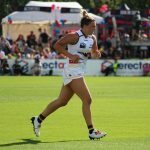 Unfortunately, she is set for a long stint on the sidelines next season after getting injured in the preliminary final, which will be a huge loss for the Pies. D’Arcy was one of Collingwood’s most consistent players across the board. She was able to play her role without fail in many games across the season and she was hard to stop when she did. D’Arcy was one of the Pies’ most solid performers in the finals, and was a key reason why the side experienced so much success during the home and away season. Against Hawthorn in the first week of finals, D’Arcy gathered 20 disposals, took six marks and laid five tackles in a great all-round game. Lambert’s experience and class around the contest was a focal point of her game. She proved to be a real play-maker and goal sneak for the Magpies, ending the season with 10 goals from her 12 matches. The new recruit slotted right into the Collingwood line-up and was a real bull around the contest, applying plenty of forward pressure. Round 16 was a standout for the 24 year-old, who had the footy on a string. She racked up 15 touches, laid four tackles and bagged three goals, causing havoc across the ground. Ross had a consistent season for the Pies, attacking the ball hard and hitting the packs strongly. She starred in Round 13, laying a whopping 12 tackles, amassing 18 touches and nailing a goal to prove her versatility and skill. Throughout the VFLW season, Ross was clean with ball in hand and showed good composure to think her way through tricky situations. The youngster provided plenty of run and carry and showed a strong pair of hands while under pressure. Her ball use was clean and precise, drawing her teammates to the space and the footy. Captained the side after crossing from South Australia and did a terrific job. Often coming off half-back or along the wing, Edwards was able to impact the contest regularly and gain her team serious ground. She put her body on the line and brought her teammates into the game. A strong leader and one that would be looked at by AFL Women’s clubs for her impact on and off the field. Alexander’s tackling pressure was intense, showing she was not afraid to put her body on the line. Her intent was fierce and she consistently helped to lock the ball in the Pies’ attacking half. She also displayed good bursts of speed to help open up space across the ground and provide overlap run for her teammates to get into damaging positions. More importantly though she proved to be a handful in the forward line with her accuracy in front of goal causing havoc for her opponents. She was the club’s leading goal kicker managing 14 goals from her 14 games. 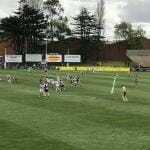 After an impressive start to the season, Collingwood was left ruing its early exit from the finals series, bowing out in the preliminary final. The Pies finished on top of the ladder with only one loss to their name, but they failed to make the most of their position in the finals. 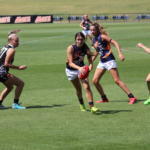 They proved to be the benchmark of the VFLW competition with their fierce intent and willingness to take the game on but will be wanting to go one match better next season and take home the premiership. The Magpies showed great composure with ball in hand and showcased their ability to pick sides apart, credit to their patience and solid structure. 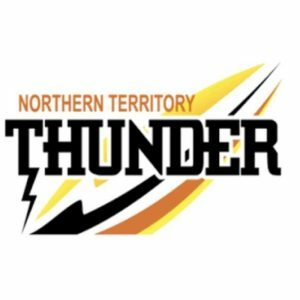 GEELONG has had a dream finals run, knocking off the formidable Northern Territory (NT) Thunder and minor premiers, Collingwood. 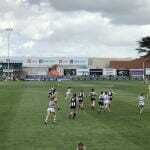 The Pies could not combat the Cats’ ferocity at Stannards Stadium on Sunday, and ultimately fell short. Geelong now goes through to the Victorian Football League (VFL) Women’s Grand Final against Hawthorn on Sunday. Geelong came out of the blocks firing, but could not capitalise on the scoreboard, matching their intense tackling pressure with just 1.5. 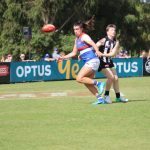 This was largely affected by an injury to Magpies star, Chloe Molloy, who sat out three quarters of the match on crutches. Collingwood evened up the scoring in the second term, with both teams kicking one goal a piece. But in the third quarter, the Pies really felt the absence of Molloy while the Cats put the foot down, kicking two goals in the dying minutes to set up a convincing victory. Despite the Pies owning the fourth term with three junk goals, it was the Cats who prevailed by 14 points. Maddie Boyd was pivotal for the Cats, as she was the only multiple goal kicker on the day. She kicked two majors and clunked plenty of contested marks, ending up with seven marks for the day. Madeline Keryk dominated in the midfield, gathering 24 disposals to go along with her four tackles. 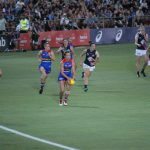 She was complemented by Geelong Falcons premiership player, Olivia Purcell, who laid a whopping 14 tackles to go along with her 15 disposals. Maddy McMahon was also a key player for the Cats, with a good all-round game. She racked up 16 disposals, five marks and four tackles. For the Pies, it was Jaimee Lambert who was the shining light. Lambert kicked a goal to go along with her 23 disposals and 11 tackles. Emma Grant also played her role across the back line, with 19 disposals, two marks and eight tackles. 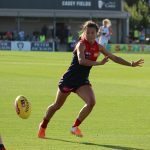 AFL Women’s teammate, Sarah D’Arcy was also solid with 17 touches, four marks and three tackles. She was complemented by captain, Jess Edwards, who kicked a goal to go along with her 12 disposals, two marks and three tackles.